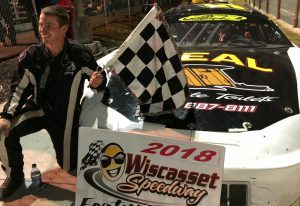 Nick Hinkley of Wiscasset celebrates his Pro Stock championship Saturday night at Wiscasset Speedway. It was Hinkley's first career title in the division. Nick Hinkley of Wiscasset celebrates his Pro Stock championship Saturday night at Wiscasset Speedway. It was Hinkley’s first career title in the division.